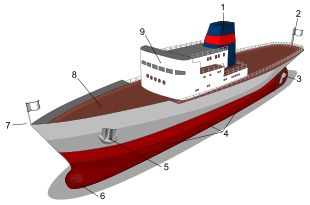 A ship is a large vehicle used to travel on water. It is bigger than a boat. Most are cargo ships, which carry most of the world's international trade. There are also many warships, passenger ships and other kinds for different purposes. The first ships used oars or the wind (or both) to make them move. From about 4000 BC the Ancient Egyptians were making wooden sail boats. By 1200 BC the Phoenicians and Greeks had begun to make bigger sailing ships which were about 30 metres (100 feet) long and could carry 90–180 tonnes of cargo. The Romans made even bigger ships which could carry up to 1,000 people and 1,000 tonnes of cargo. The 8th century saw the rise of the Vikings, who were famous for their "longships" and which were mainly used for raiding other countries, but also for trading. The longships had flat bottoms so they could move in shallow (not deep) rivers. Sailing ships were used for thousands of years, but they were very important from the Age of Discovery to the 19th century. The Chinese admiral Zheng He commanded a fleet of large 'treasure ships' on seven voyages all over Asia up to East-Africa in the early fifteenth century. The most successful and largest fleet in the 17th century was the Dutch fleet (see the Netherlands). For trade and transport the Dutch often used a particular kind of trading ship, called a flute (fluyt in Dutch). 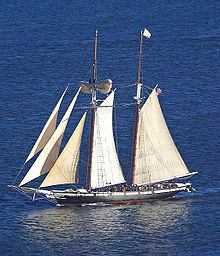 Transport of people and cargo on sailing ships became rare in the early 20th century. In the 19th century, steamboats became commonplace. At one time, the steamships Titanic, Olympic, and Britannic were the largest ships in the world, Titanic sank on her maiden voyage after hitting an iceberg, becoming one of the most famous shipwrecks of all time, the Olympic was Titanic 's nearly identical twin, and actually set sail before Titanic and was scrapped in the 1930s after a very successful career including her being a passenger liner and a warship in World War I. The Britannic was the largest of these three sister ships, and was supposed to be more grand and elegant than the Titanic, but before she set sail on her maiden voyage, WWI broke out and she was stripped of her elegant furniture and elaborate paneling and became a hospital ship. During her term as a hospital ship, she was sunk by either a mine or torpedo, no one knows for sure. The Titanic lies at the bottom of the North Atlantic Ocean, off the coast of Nova Scotia, and the Britannic lies in the Aegean Sea, off the coast of the Island of Kea. After World War II ships with diesel engines became commonplace. Passenger airliners replaced passenger ships for long trips in the late 20th century. Cargo ships became much bigger. The main kinds are container ships for mostly manufactured goods, and bulk carriers including oil tankers. The world's largest ship is the Prelude, owned by Shell. It is being built on Geoje Island, South Korea. It is 488m long and has the internal capacity greater than the total volume of four large aircraft carriers. What it will do is collect natural gas off the coast of Australia, and liquify it. When liquified, the hydrocarbon takes up 600 times less space than its gas. Smaller tankers will take the liquid gas to its buyers. The ship will do liquifying and temporary storage, which is usually done on land. Shell believes this justifies the cost of the ship. The shipping yard builds all kinds of structures for the oil industry. It employs 30,000 workers. Amidships - near the middle of the ship. Stern - the back of the ship. Aft - in the direction of the stern. Astern - behind the ship. Starboard - the right side of the ship. Port - the left side of the ship. Bridge - the room in which the ship is controlled. Cabin - a room where a crew member lives. Hold - an area inside the ship used to carry goods. Hull - the main body of the ship. Keel - a beam running from stern to bow. Mast - a central pole on which sails are hung. Brig - Prison cells in the ship. Bulk carrier - very large ship used for carrying very heavy cargo. Catamaran - a ship with two hulls. Cruise ship - a large passenger ship that takes people on holiday or vacations. Ferry - a passenger ship which often carries vehicles as well as people. Supertanker - a very large ship usually used for carrying oil.